Inception – Film of the decade? One of the interesting things to contemplate in the study of film is the creative contributions of the various participants. Who exactly is the author of a film? The screenwriter? The Director? The Actor? The Editor? Inception, however, contains the input of a true Auteur. Perhaps the best filmmaker going around today, Christopher Nolan writes, directs and produces this stunningly brilliant film, one that caps a filmography that includes The Prestige, Dark Knight and Memento (a must see thriller whose plot runs in reverse). For all its complexity, Inception is essentially a ‘con’ film; think Paul Newman and Robert Redford in The Sting. It tells the story of Cobb (Leonardo DiCaprio) and his team, whose job it is to ‘extract’ ideas and secrets from people while they dream. A criminal unable to return to his home and children, Cobb is invited to perform one last ‘job’ on the promise that, if successful, his record will be expunged and he will be allowed to return home. This time, however, his team is asked to perform an ‘inception’ – to implant an idea into the mind of the mark. Sounds simple enough, but the genius of the film is to carry forward its plot while characters move in and out of the ‘the real’ world and the dream world. In this way, the film adds to the typical ‘con’ movie a matrix-like twisting of reality. Audiences are glued to the screen by the thrill of plot, the beauty and interplay of the setting (the dream world is effected by what is going on in the real), the pace of the action and in the sheer joy of trying to work out what on earth (or in the mind) is happening. 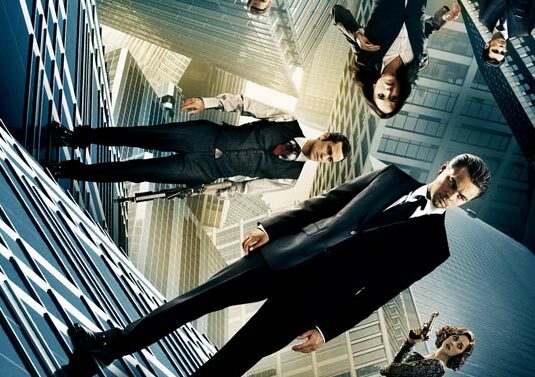 Inception ticks most of the boxes that are characteristic of the really great films. At a time when almost everything has been done before, it is a uniquely surprising movie. I for one, am bored stiff of action films, with their car chases and gunfights that all look the same. Inception has both, but it adds the surprise of multi-layered action that defies of the laws of physics, of car chases that have anti-gravity impacts, of gunfights in which death may be to wake from a dream or to lose grip on reality. The action is beautifully and cleverly shot, but its special effects do not overwhelm either the story or the development of character. Inception presents the audience with interesting and ambiguous people. DiCaprio excels as Cobb and manages to elicit sympathy, notwithstanding the fact that he is a deeply broken and immoral person. The combination of twisting plot, strange setting, and brain bending actions means that this is a film that sticks in the mind, invites conversation and, even more unusually, invites a second (and third) viewing. And while the cinema is normally a passive experience, Inception asks audiences to use their brains in the effort to make sense of the story and follow the plot. If the film has a weakness it is that the intelligence of the narrative leaves the false impression that its meaning is profound. It does raise questions about the nature of reality, inviting a postmodern exploration into the construction and pliability of truth. But these are themes that have been explored better and in more depth elsewhere (eg. Blade Runner, Matrix). I suspect, however, that to think the film has philosophical and theological significance is to miss the point. It is a simple crime drama, and its capacity to make you think is tied into the twists and turns of the story. From my perspective, this is the film of the year (even of the decade thus far). Thank you Mr Nolan, for reminding us of what movies can be. This film is definitely a wake-up call to those in the cinema business. I hope other auteurs (directors/writers) recognize the greater potential movies have in providing a visual story. * Also, I heard that Mel Gibson is developing a similar film set for Christmas. It’s about how three wise men are hired to plant the idea of virginity in the mind of a young Israeli woman — “Immaculate Inception”. Can’t wait. This is an interesting movie on my must watch list. May have to wait for it to come out on DVD though. I have to ask the question though. “Do film makers normally make a movie with the intention of having a theological / philosphical intention behind them, or can we be guilty of being super spiro in reading something that is not there.. or not intended”? I think that the idea of planting an idea into someone that redefines ones identity and life can parallel the gospel. As the cross of Jesus should (Obviously more than simply an idea) and can have the ability to redefine someones perception of reality, as we are made new. Maybe I am being too fanciful. Shane, this is a fascinating idea. Perhaps i was too quick to dismiss the theological significance of the film (i think i need a second viewing). In any event, it is surely significant to assert that a simply idea has a transformative power – one that can change a person and through that person transform whole social structures.